STEM education (science, technology, engineering, and math) is a national priority that must start with our youngest learners. The arts and sciences are natural partners, sharing habits of mind that develop creative problem-solving, imaginative thinking, and transference of skills and knowledge to new experiences. 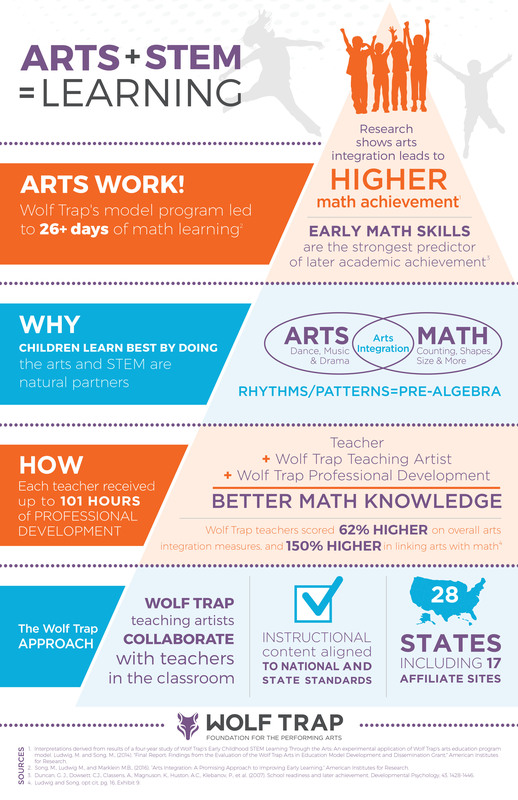 A recent independent study—funded by the US Department of Education and conducted in Fairfax County, VA—indicates that teachers using Wolf Trap Institute’s arts-integrated strategies have significant positive effect on children’s learning. Classroom residencies formed the core of the study and focused specifically on using the arts to improve math skills. Conducted by American Institutes for Research (AIR), an independent third-party research firm, the study took place over 4 years (2010-2014). The Wolf Trap Institute partnered with Fairfax County, VA Public Schools to execute a randomized, controlled study of the impact of arts-integrated techniques on early childhood STEM learning, as well as on professional development for teachers. Wolf Trap Foundation’s Early STEM/Arts program had a statistically significant, positive impact on students’ math achievement. Wolf Trap students outperformed peers in control schools on the Early Math Diagnostic Assessment (EMDA). Teachers trained in Wolf Trap Institute techniques offered more opportunities for arts integration, and demonstrated higher levels of arts integration, particularly with respect to linking arts and math. The program demonstrated all features of effective, high quality professional development (PD). In measuring Wolf Trap Institute’s model against standards of effective PD, research confirms that Wolf Trap provides high quality PD by thoroughly integrating form, duration, collective participation, content, active learning, and coherence. Teachers said the use of music, movement, and drama was beneficial for all students, but in particular for students who were shy, who had never been to school, or who were speaking another language.